The Financial Times did some analysis of Donald Trump's controversial immigration restrictions (which were claimed to be about protecting Americans from terrorism). Those resettling in the US are interviewed and screened for terrorism and crime links by several US agencies, including the National Counterterrorism Center, the FBI, the Department of Homeland Security and the State Department. Mr Trump cited terrorism risks as his reason for limiting the number of refugees the US takes. However, since the US refugee programme began in 1975, more than 3.2m refugees have entered the US and only three have carried out a deadly terrorist attack. 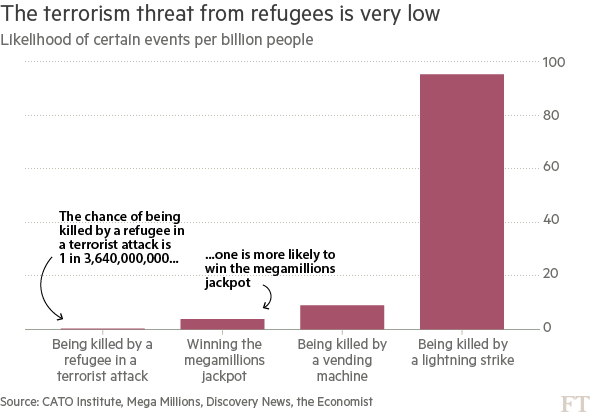 They claim that Americans are more at risk from death caused by vending machines than death caused by terrorist attacks committed by refugees. Are their estimates of the risks credible? NPR article on the chance of winning the lottery from 2012 notes that it's more likely to be killed by a vending machine. The odds given : 1 in 112 million. And that means it's more likely, at least judging from one sort-of-old but widely cited statistic, that you'll be crushed to death by a vending machine as you try to shake loose a stubborn candy bar. The supposed odds of such a death? About 1 in 112 million. The link to the source of their data is dead, but it seems likely that 1 in 3.6 billion odds are lower than a whole lot of very unlikely causes of death (struck by lightning while drowning: 1 in 183 million). In other words, not all refugees are asylees, but all asylees are refugees. By not including asylees in the definition of "refugees" the Financial Times disregarded attacks such as the Boston Marathon Bombings. Tamerlan and Dzhokhar Tsarnaev (the Boston Marathon bombers) were refugees, but the FT did not included them. Ibragim Todashev, who allegedly helped Tamerlan Tsarnaev kill 3 Jewish men on 11 September 2011, was a refugee, but the FT did not include him. 1993 World Trade Center bomber Ramzi Yousef was a refugee, but the FT did not include him. The FT left out 15 terrorism deaths: 7 from the 1993 World Trade Center bombing, 3 from the 11 September 2011 killings, and 5 from the Boston Bombing an aftermath. So instead of the 3 deaths that FT counted based on the source Terrorism and Immigration, there were really 18. The alarming incidents all happened at American military bases in Germany and Korea. Also, though the OP labels the graph "per billion people", the data, at least for terrorism, is per billion people per year. On the same basis the odds of winning the mega millions jackpot is much higher than what the OP graph says. 8 people per year with a population of 320,000,000 is 25 per billion people per year, for example. According to this analysis on CrossValidated.SE, we don't really know. The first problem with this data is non-stationariness. These numbers hold only if the number of refugees and vending machines stay constant. These 3 deaths are not "deaths per 1M of refugees", it's a total. Let 10 times more refugees in, and you'll have to multiply that number by 10. Taking that chart data to the extreme, I could say that illegal immigrants are 3 times less dangerous than refugees, so why have border control at all? The second (and IMO more important problem) is statistical significance. 3 deaths over 35 years is simply too little to predict similar deaths in the future. However, the author acknowledges that the original article's point may still be valid, despite flawed statistical proof. There are legitimate issues with the chart, but the FT's broader point is correct that terrorism in the U.S. is quite rare. 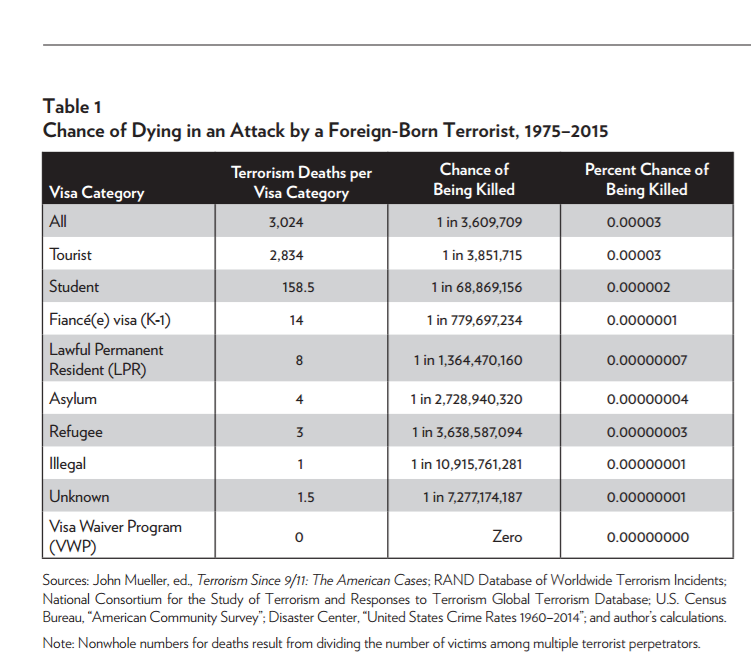 Your chance of being killed by a foreign born terrorist in the United States is close to zero. Not the answer you're looking for? Browse other questions tagged united-states security terrorism .